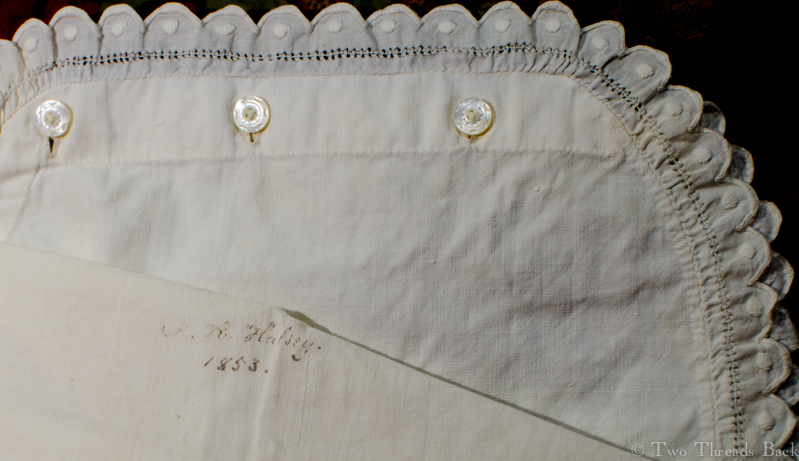 Beulah Hosley did indeed land a job as a sewing instructor – for $30 a month! Her date of assignment was June 17, 1912. But she resigned three days later. What happened to Miss Hosley and why am I curious? It’s because I found her name inside the cover of a sewing manual from 1911. The textbook is a neat little edition, with all her samples carefully worked and attached to the pages. 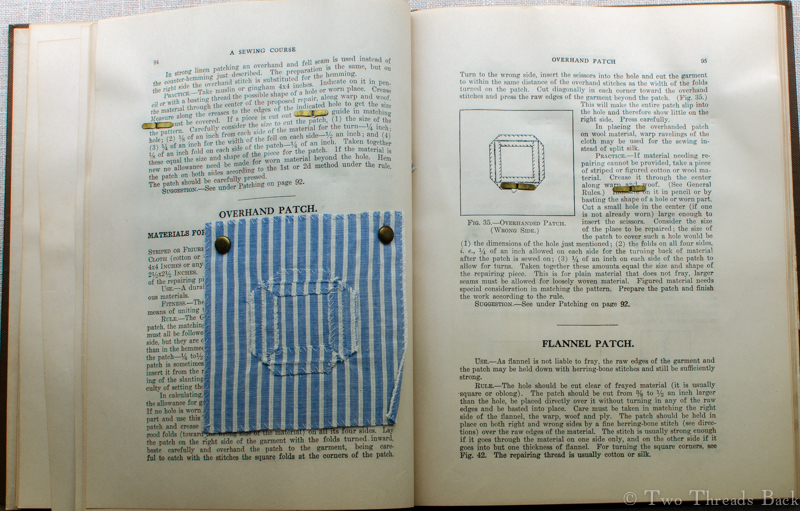 Most versions of this book that I’ve come across are larger with more samples, but it appears that Beulah learned all that was necessary to become a sewing teacher. She was, if not exactly ahead of her time, at least up with the times. At age 21, her graduation in Domestic Science from the State School of Agriculture in Canton, New York qualified her to teach or to … keep house very nicely! “The fourth annual commencement exercises of the State School of Agriculture were held at the opera house yesterday afternoon, and proved intensely interesting. The State School of Agriculture and the Domestic Science department are advancing by leaps and bounds, and the entering class is expected to largely exceed any prior one.” – The Ogdensburg Journal, June 12, 1912. 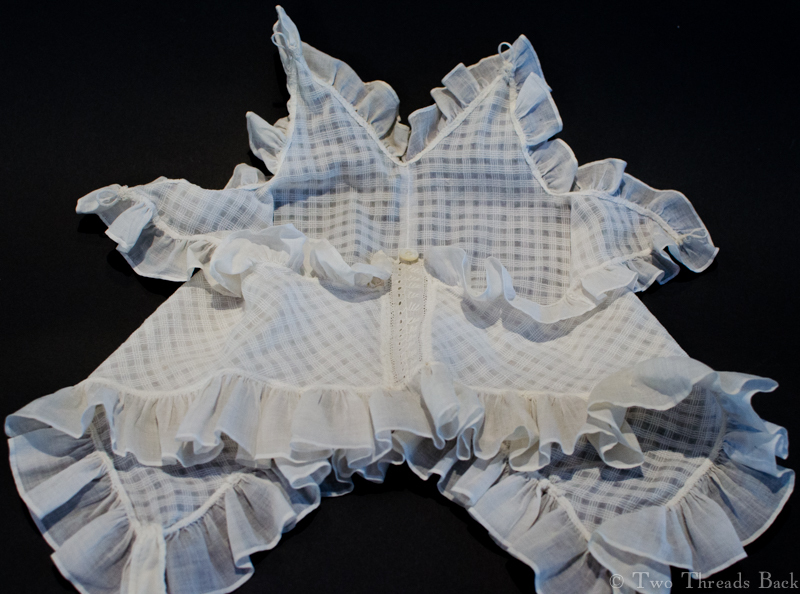 Beulah Hosley learned how to hem, tuck, herring-bone, darn, mend, gather, and do all the other stitches required for handwork. I would guess that she also learned to use a machine and perhaps some basic garment cutting, but I didn’t find any further information on those classes. But why so short a tenure at her first job? Homesickness? It was far from her home in St. Lawrence County. 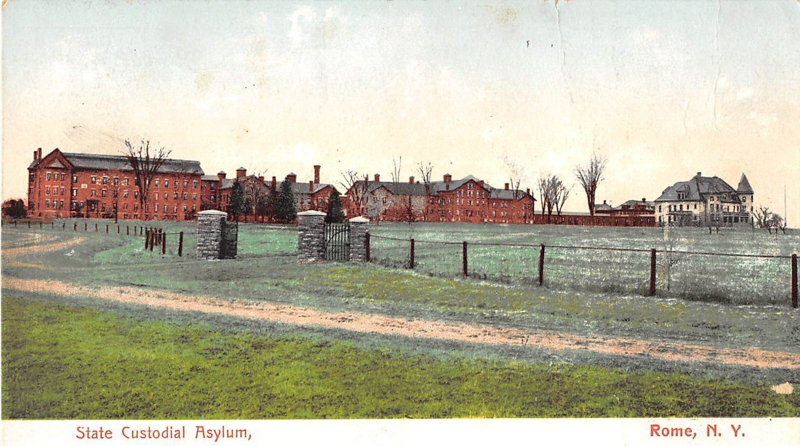 Or perhaps it was where she was teaching: the Rome State Custodial Asylum in Oneida County New York. The name conjures Dickensian images of miserable people living in wretched conditions. But when I read more about the early years of the home, I realized that Charles Dickens and Nellie Bly had prejudiced me somewhat. Somewhat. The institution was founded in 1827 as the Oneida County Poorhouse, and it remained in existence until 1989. 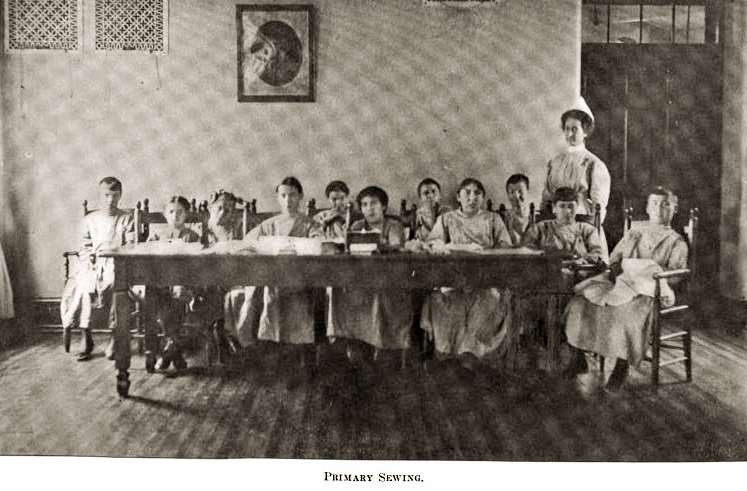 As I scanned circa 1910 reports from the Board of Managers, it was evident that much care and effort went into the enormous task of providing for and educating the people who lived there. They had a dairy, a hennery, a piggery; an orchestra, a baseball team, a choir; a menagerie, fairs, and concerts. Everything was recorded and reported, from the number of cases of tuberculosis to pink eye to syphilis, as well as how many quarts of blackberries and currants were consumed. 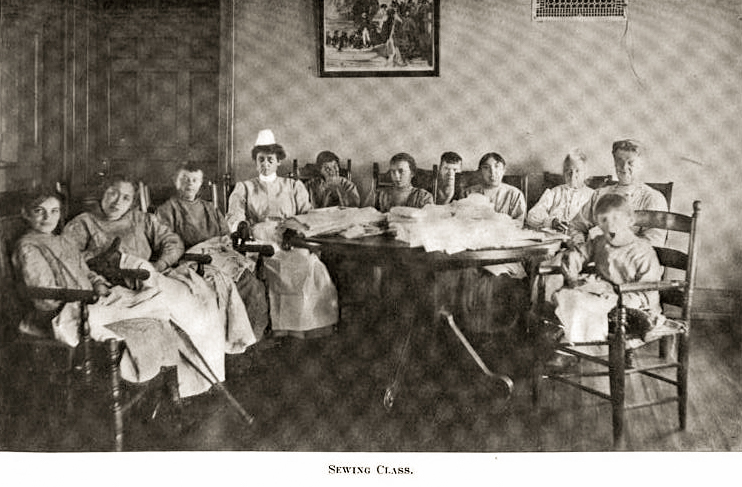 And of course, sewing classes! Still, to read the reports is to glimpse the struggles, the suffering, and the shame found even in an “enlightened” institution in the early 1900s. But back to Beulah’s story. I haven’t learned why she didn’t stay there, nor whether she found another teaching job. 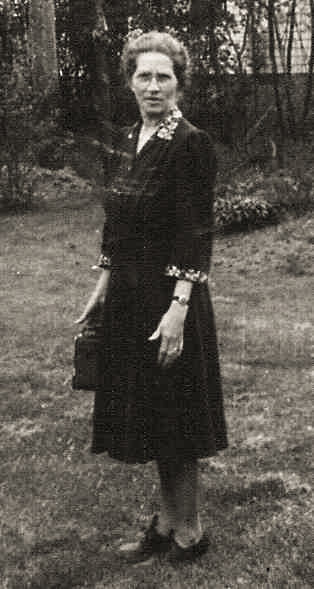 I do know that she went on to live a comfortable life; she married a couple of years later and had children. 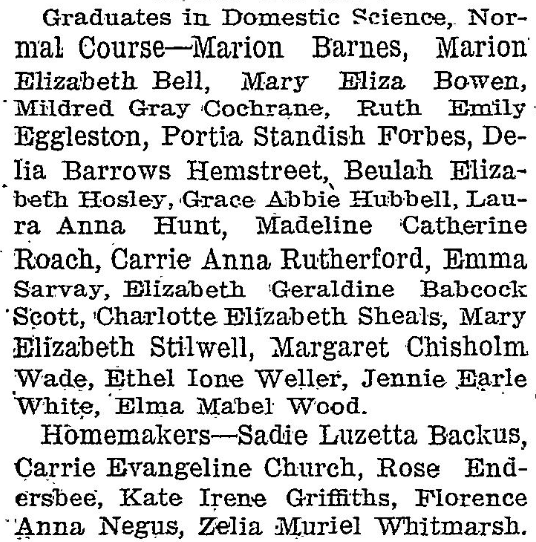 Her name appeared in the college alumni publications for many decades after. Did she use her sewing skills at home? Quite possibly. She certainly left a lovely record of the skills she acquired, beautifully preserved for our admiration! 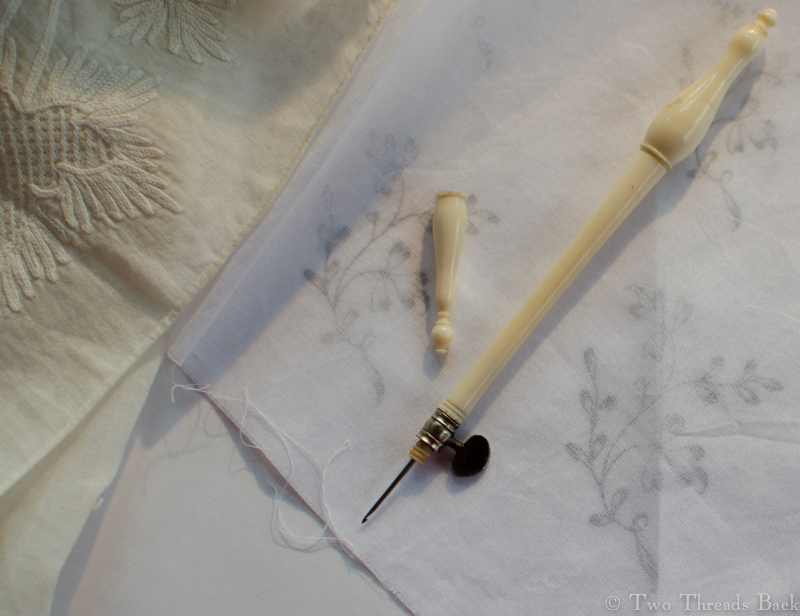 No, I’m not delving into postmodernism here, I’m talking about sewing – and unsewing! I was sitting on my porch last week, relishing the warm spring breezes and taking advantage of the bright afternoon light to salvage a sad old black silk skirt. As I worked, I realized that most of the sewing had been done by hand, and that I might pay tribute to those hands by sharing pictures before it was gone forever. 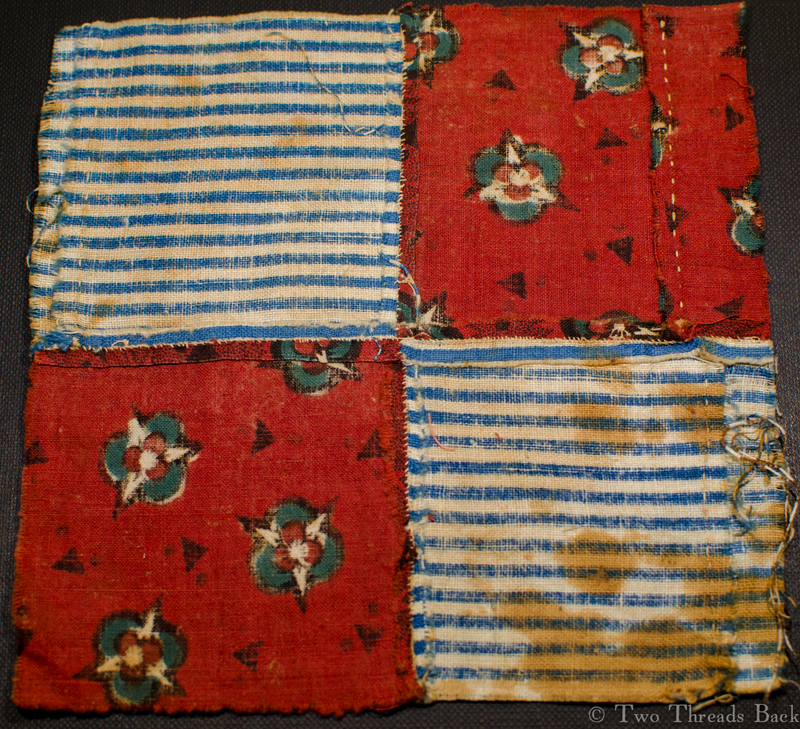 Lest you think I cannibalize antique textiles lightly, let me assure you there was no saving this piece. 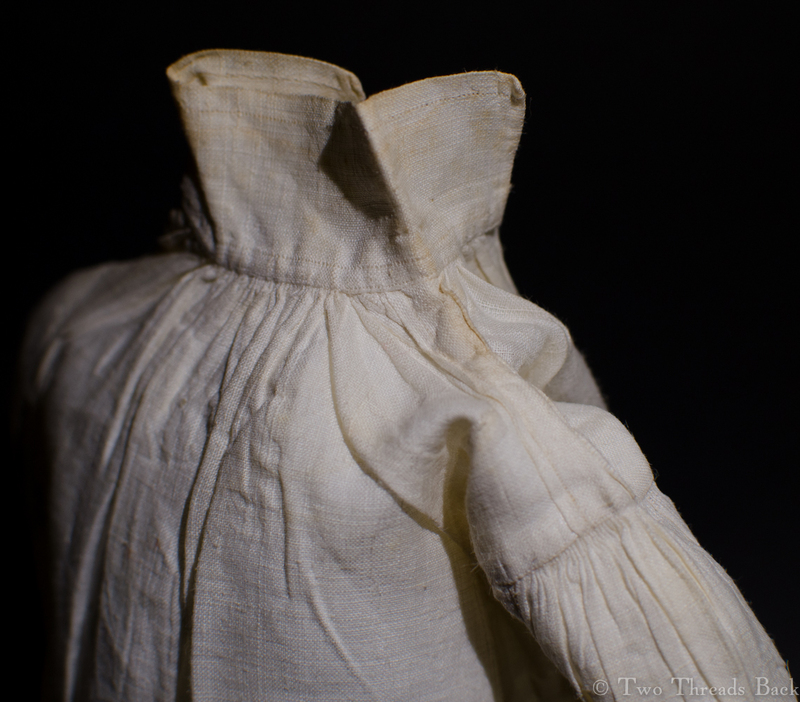 It was a silk faille gored skirt – of such a generic cut that I hesitate even to date it – which had begun to shred and shatter all over. 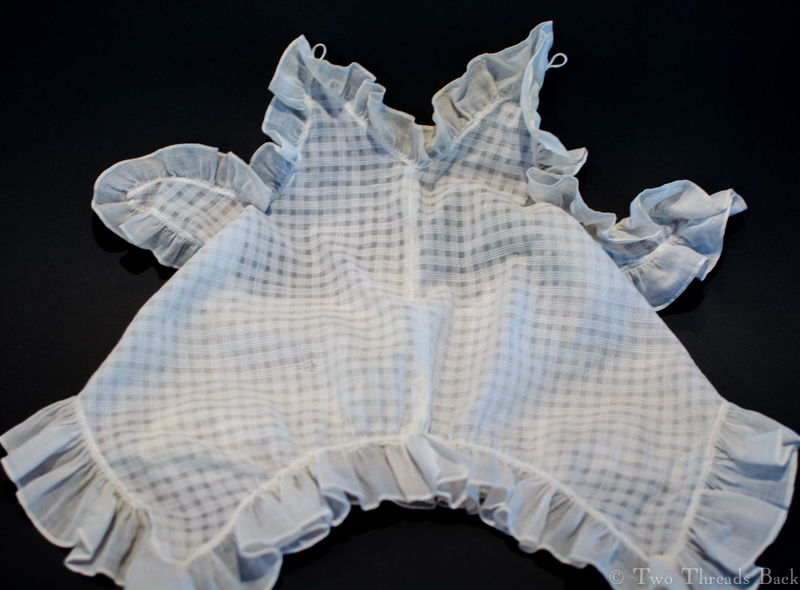 The lining was in excellent condition though, so I wanted to preserve that for reuse. Unfortunately, I didn’t think to take a picture of the whole skirt before I began. Although it might not have added much to this post since solid shiny black is notoriously hard to photograph! The cut was smooth and somewhat fitted across the front, tapering slightly toward an “A-line” silhouette, with tight gathers in the back. 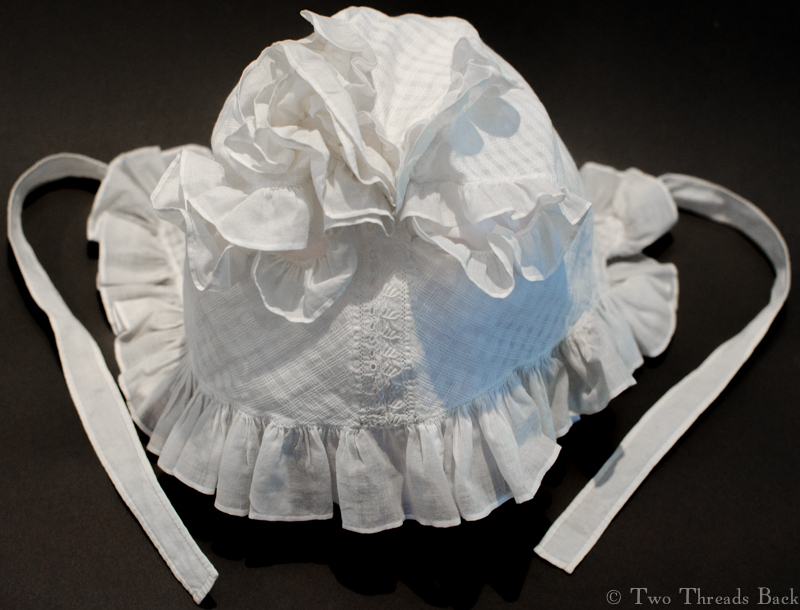 It had a narrow waistband, and two tiers of ruffles trimmed the hem. 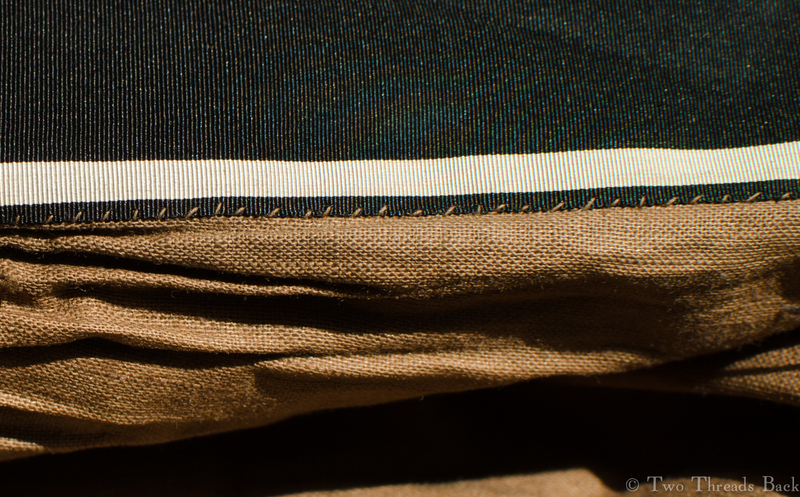 Side seam of skirt, running stitches with a few backstitches piled on for good measure. 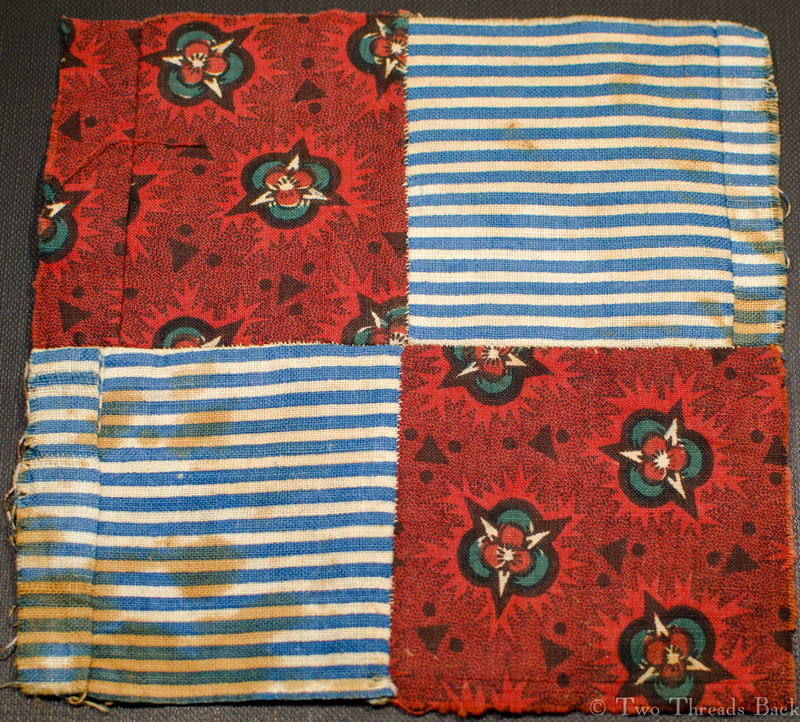 The silk fabric was about 21″ wide with white stripes along each selvage. 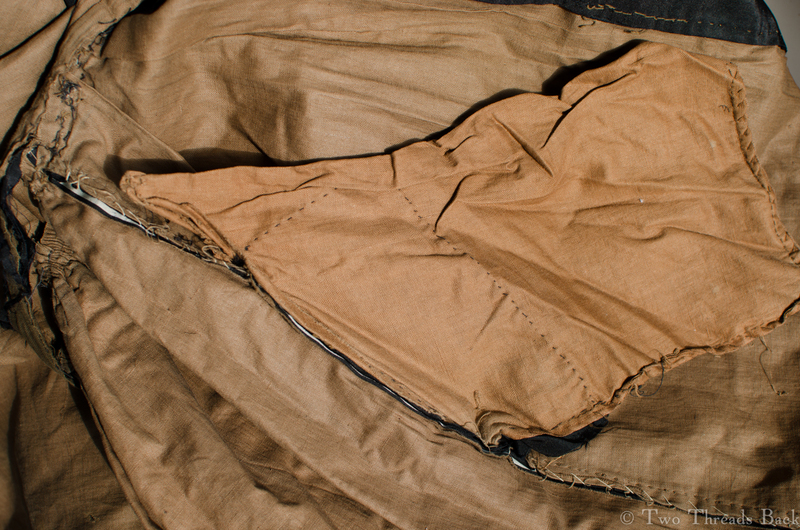 The skirt was completely lined with the standard brown cotton, and then an extra piece of darker glazed cotton was added to the bottom ten inches. 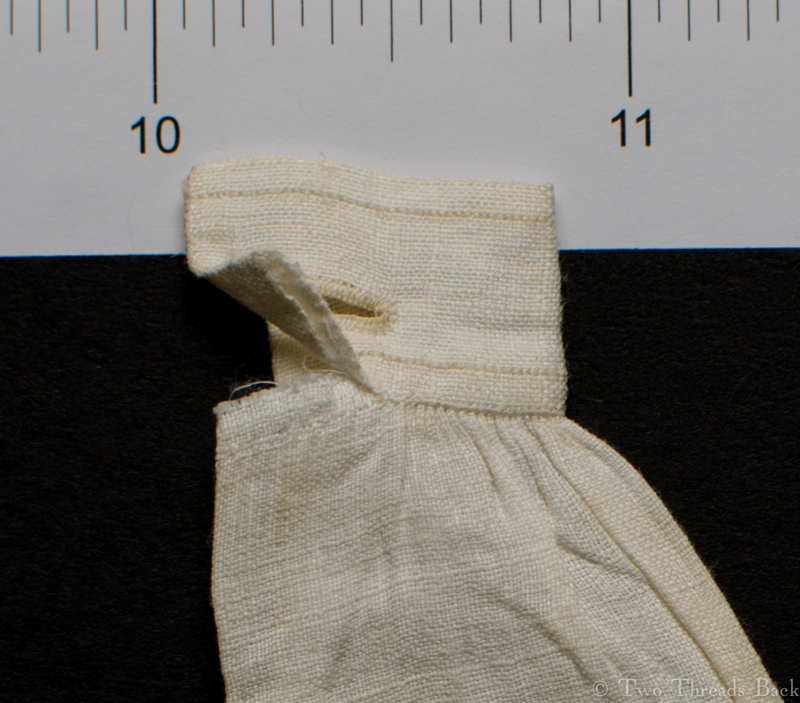 A velvet binding strip protected the edge of the hem. 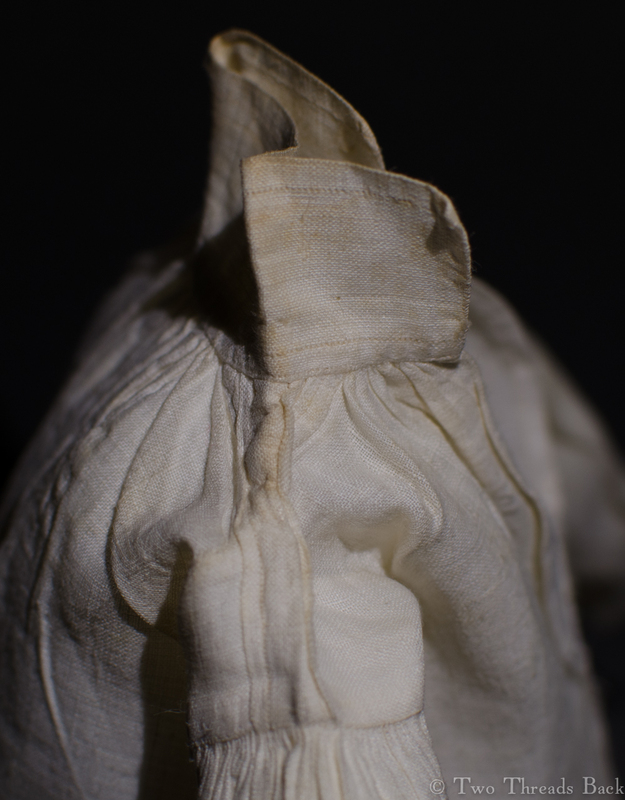 There was one deep pocket which looked like a later, rather clumsy, addition. 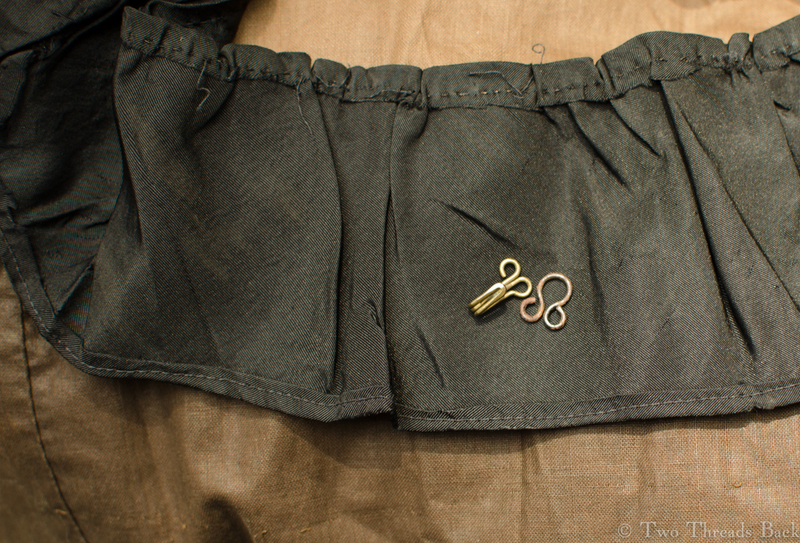 The extra lining along the lower part of the skirt is neatly hemmed down. 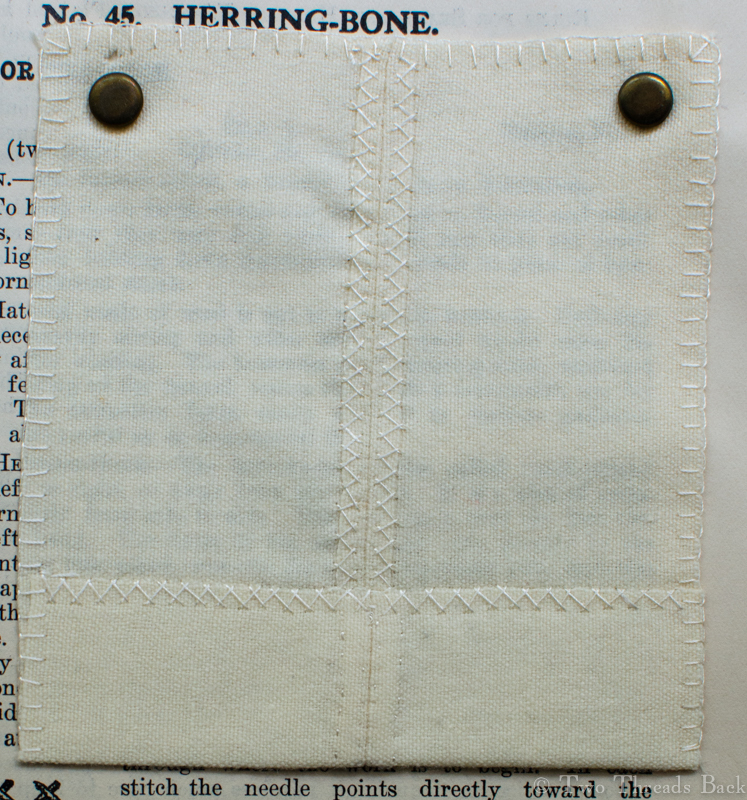 A view of the pocket from inside. Maybe added later? 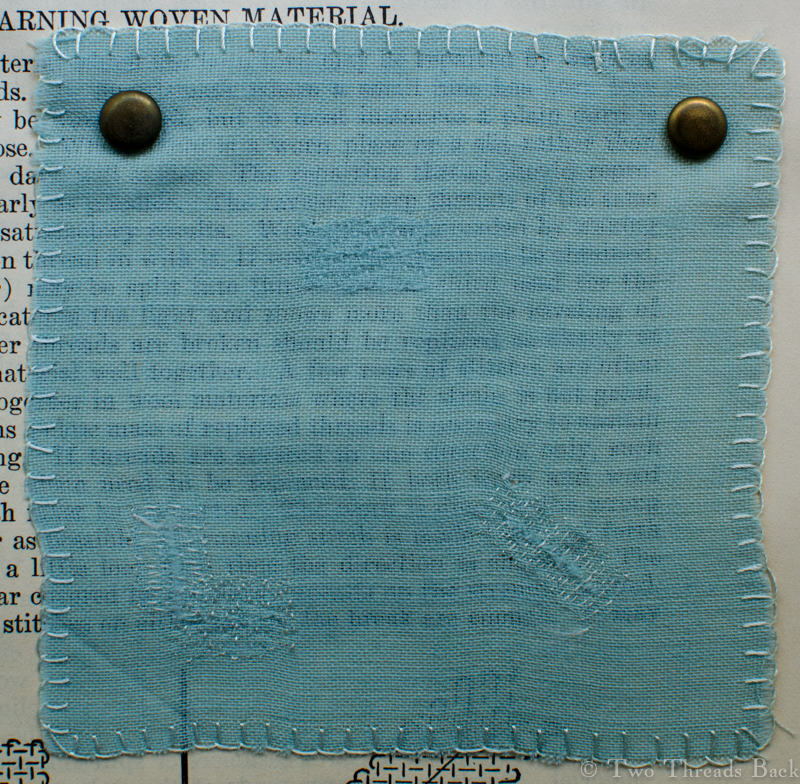 I hadn’t expected to find hand sewing in this piece, so I was intrigued to note the different types of stitching and thread. 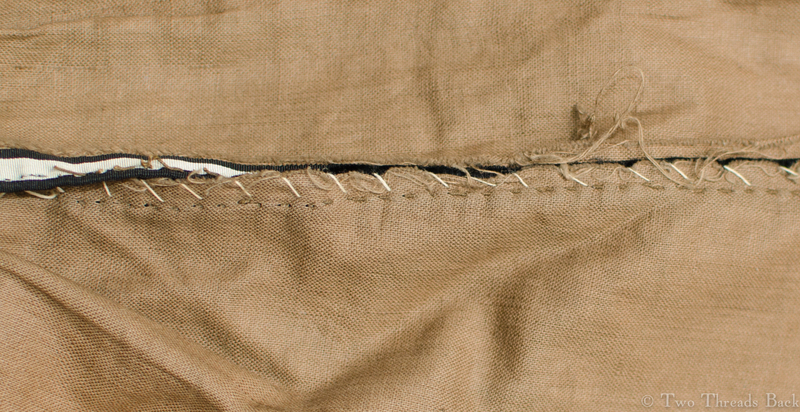 The long side seams used a basic running stitch made with a heavy brown cotton thread. 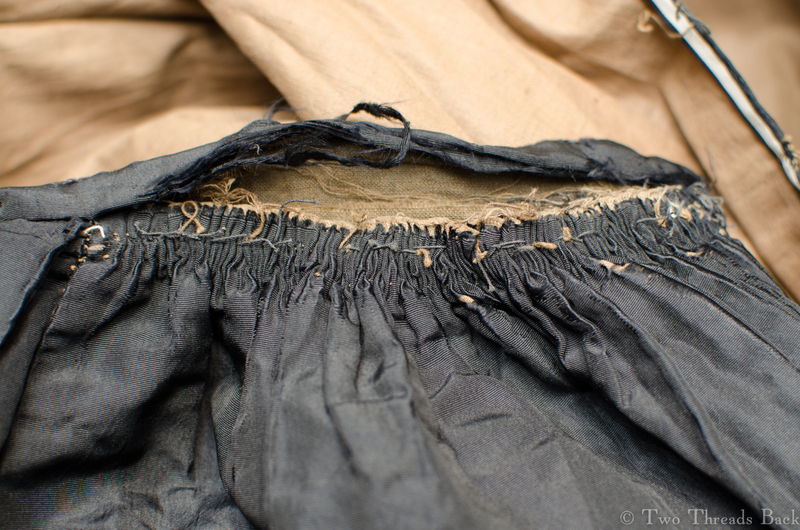 Although the finished skirt was nice and sturdy, some of the stitches weren’t particularly neat or even. 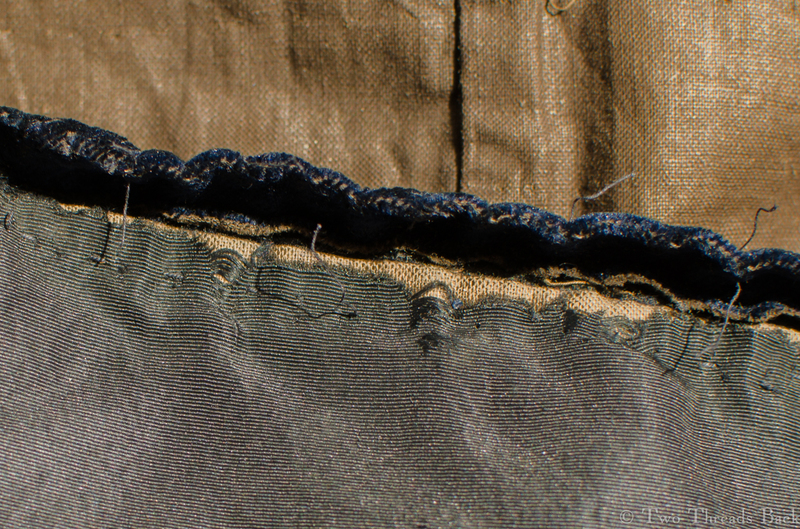 The only seam finishing, overcasting, was done where the lining edge was raw. I don’t think the maker was too worried about raveling. 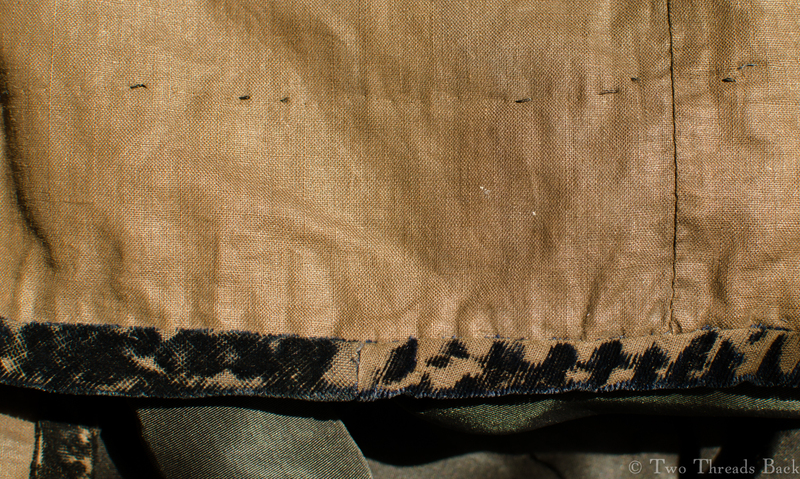 Raw edges of lining were roughly overcast with a light colored thread. The waist was “gauged” in the back. 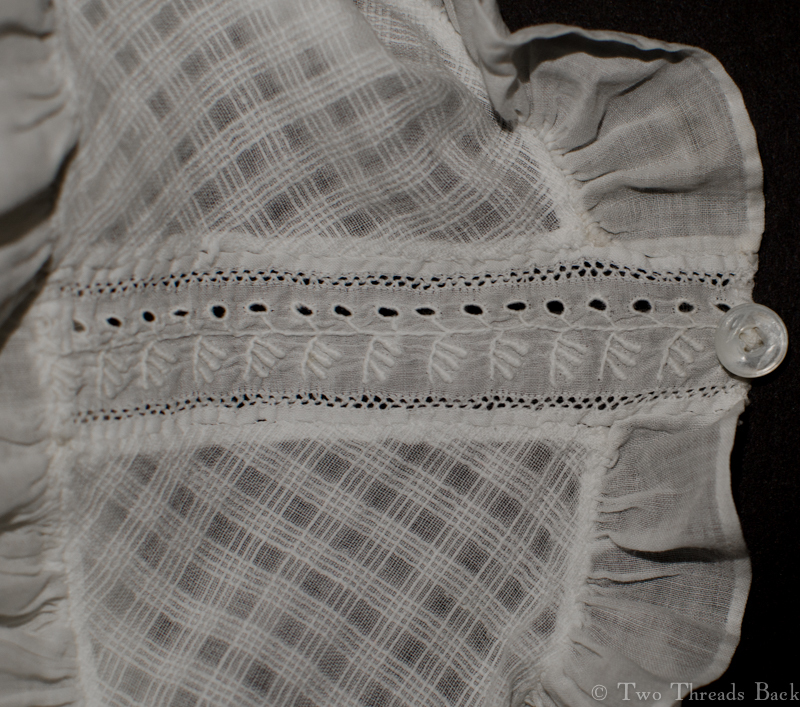 Machine work was limited to the top stitching of the waistband and the hems of the bias-cut ruffles. 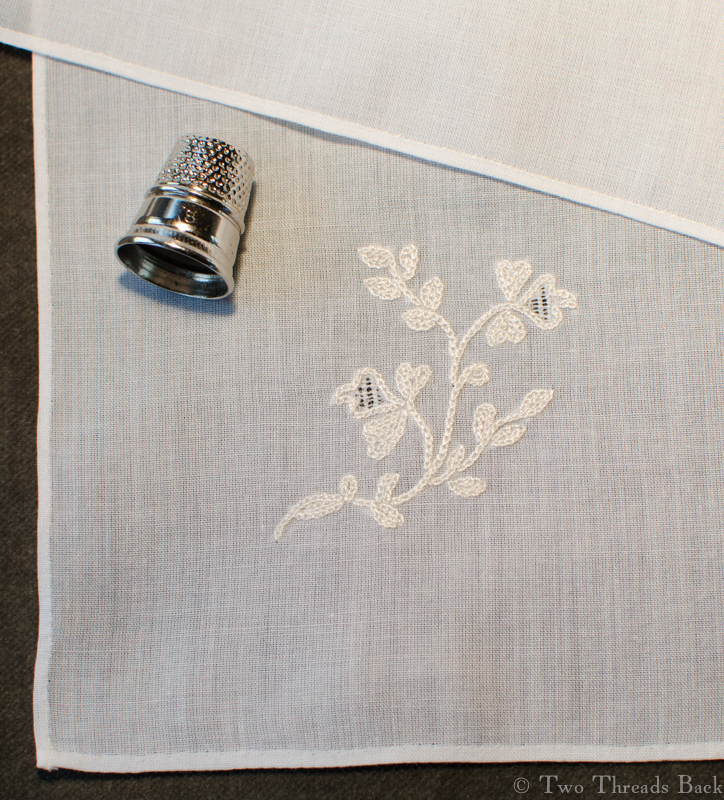 The only careful handwork was the finishing in some places on the lining. 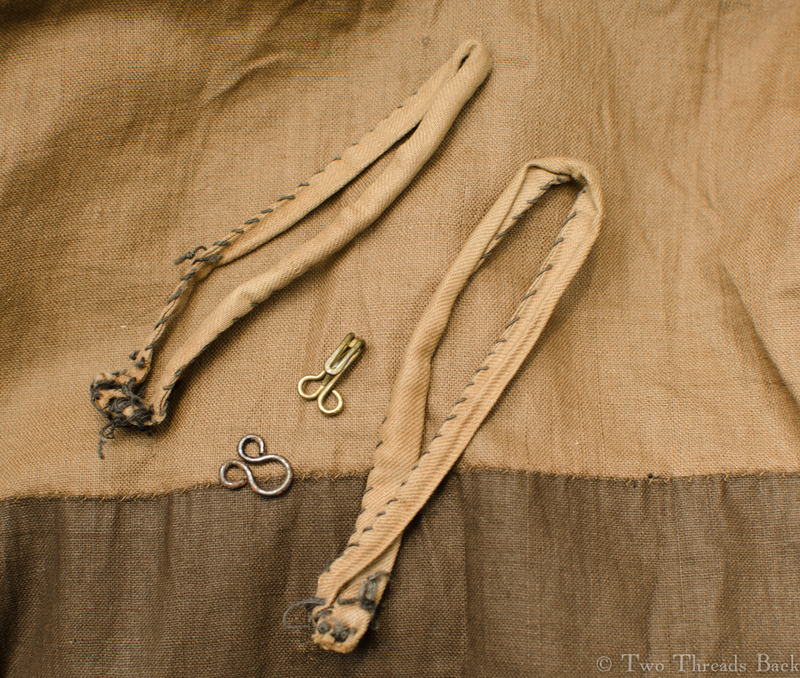 A brass hook and eye were the only fastening, and two loops were attached inside for hanging. 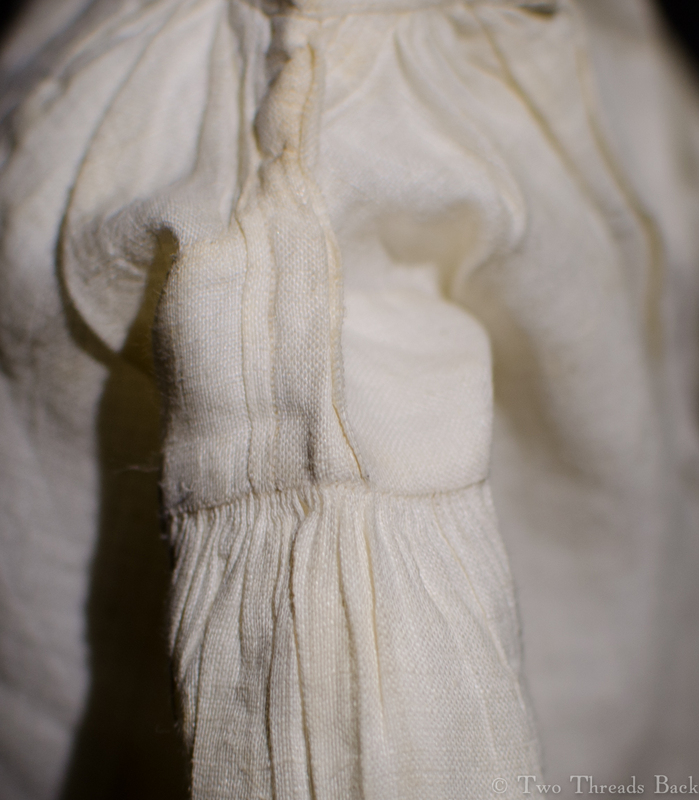 The skirt back was tightly gathered using the gauging technique. Here’s a view of the gathers from the inside. 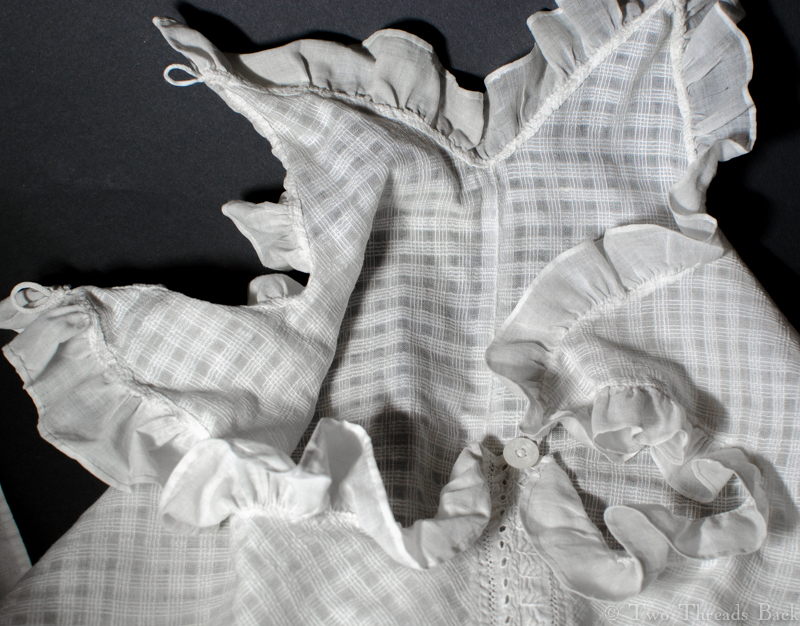 The ruffle was hemmed by machine, but gathering stitches were made by hand. And it looks like they were done at high speed! 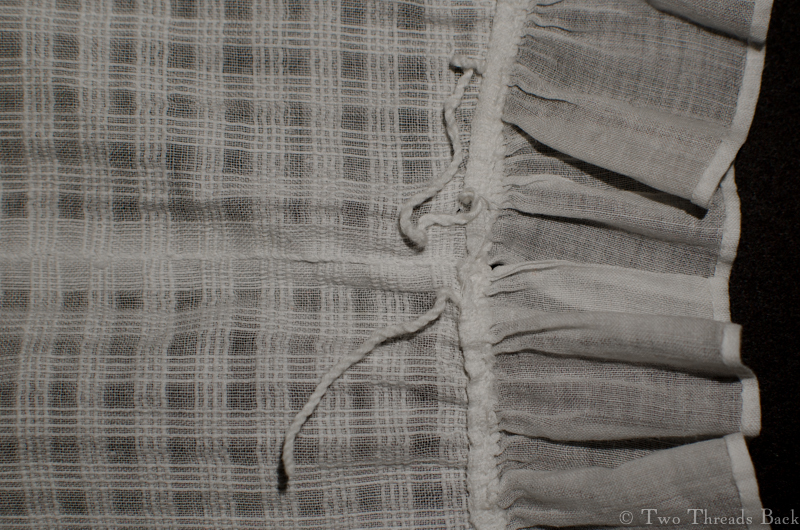 The seamstress took extra pains when hemming down the inside of the placket opening with a finer weight thread. 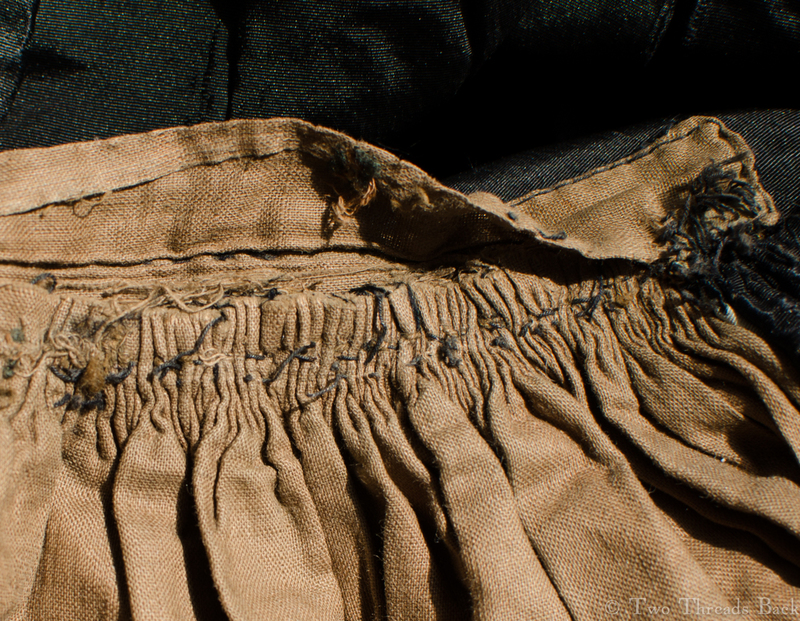 It was common in the 19th century to finish skirt hems with a sturdy braid, wool or velvet, to protect them from wear. It could be purchased ready-made, but this velvet strip appeared homemade. The deconstruction process was predictably tedious, but there was one moment that’s hard to describe. 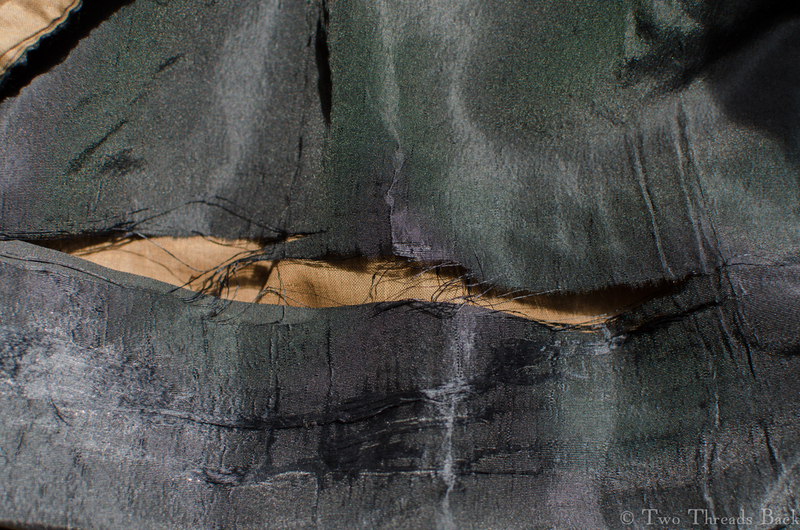 I was working on the old velvet at the hem when out spilled sand and bits of twigs. The debris had obviously been locked inside for a more than a century. It was as if a shadow passed by while I worked. Who was the woman who wore this skirt? Where was she walking, what was she doing, what was she thinking on the day when her shoes kicked up that sand? I don’t suppose I’ll ever know. But I hope her afternoon was as lovely as the one I enjoyed. I tried to offer a peek inside the velvet, but it’s too dark to see. I couldn’t hold the crease open with one hand and take a picture with the other! Yesterday a friend sent me a link to the most exciting news I’ve seen all year. Mr. Darcy’s Shirt is coming to the U.S.! Yes, you can forget Tutankhamun’s treasures or the Beauty of Xiaohe. Mr. Darcy’s shirt outranks them all. Who can forget the (totally not in the book) scene from the 1995 Pride and Prejudice film where Mr. Darcy rises from the lake at Pemberley after his swim, only to run into the startled and stunned Miss Elizabeth Bennett? Be still my heart. Unfortunately I won’t get to see the celebrity shirt on display, so I’ll have to content myself with a miniature version. 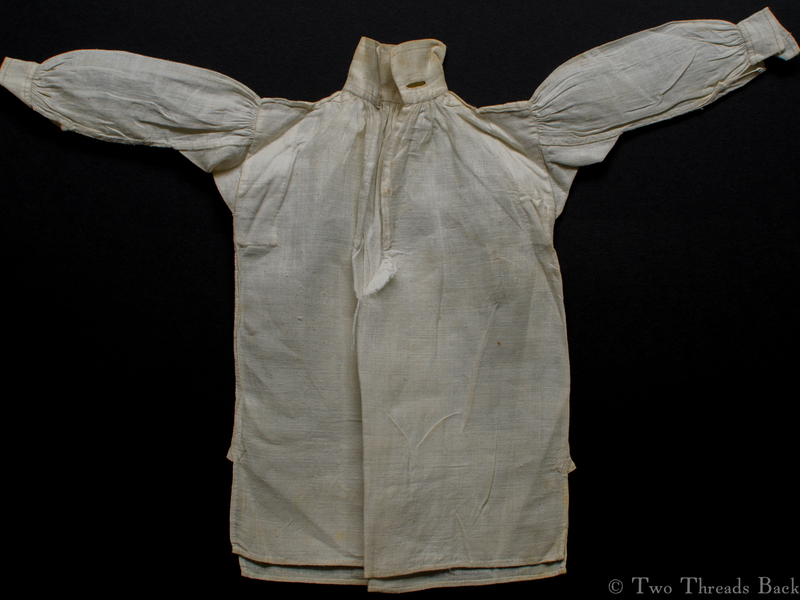 This is a tiny “sampler” shirt dated 1838, very much like the square-cut linen one that embarrassed the soggy Colin Firth and melted the rest of us. 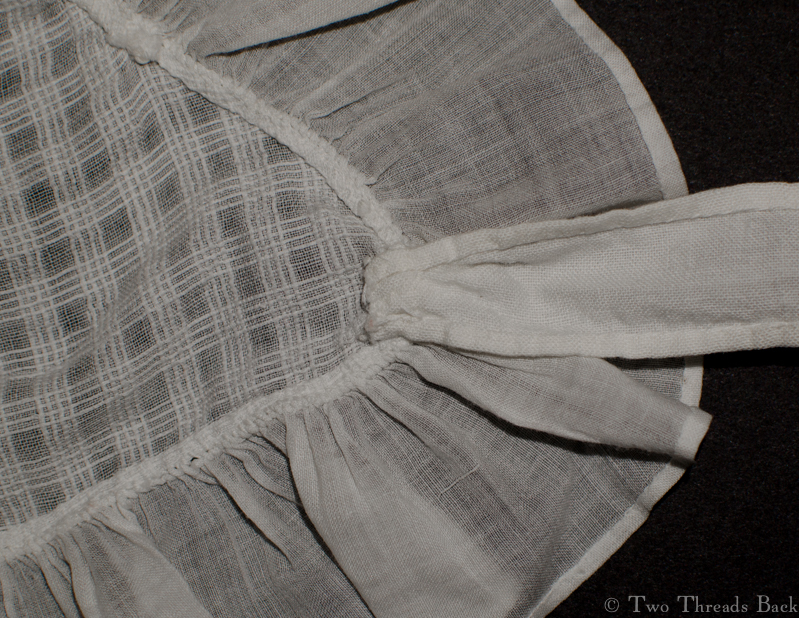 It measures 7 inches from the top of the tall collar to the hem. 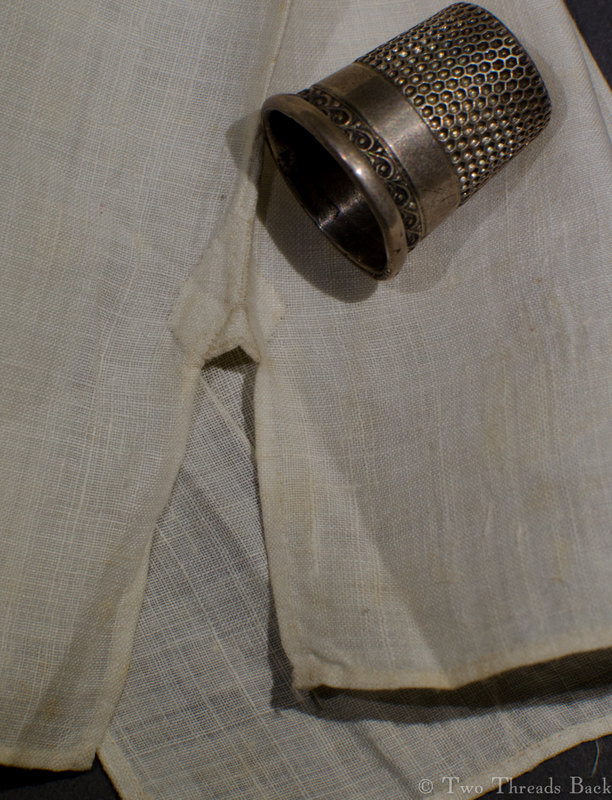 The cuff is 1 and 3/8 by 1/2 inch. The backstitches per inch are so small that I cannot count them. 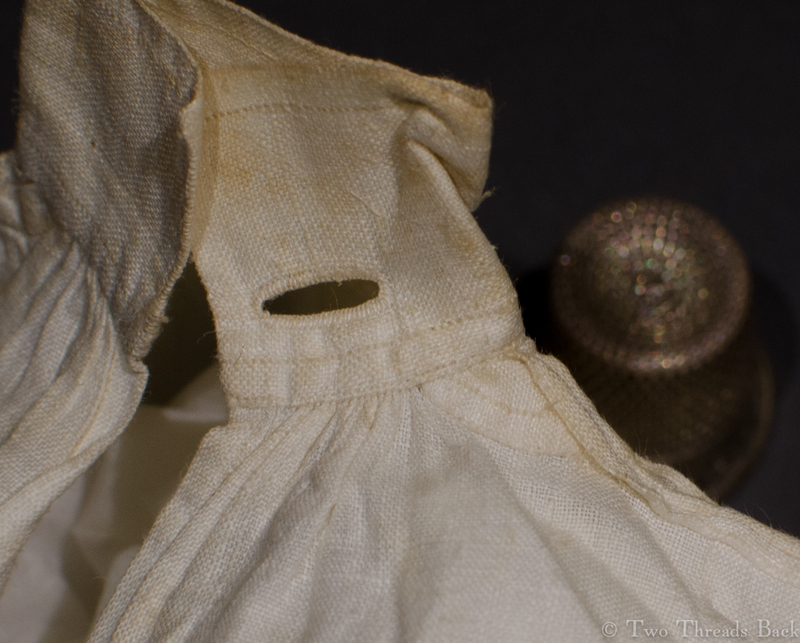 There are microscopic gussets on the collar, the sleeve openings at the wrists, and the side flaps. Oh, and of course there are the underarm gussets that are a whopping 1 inch long. 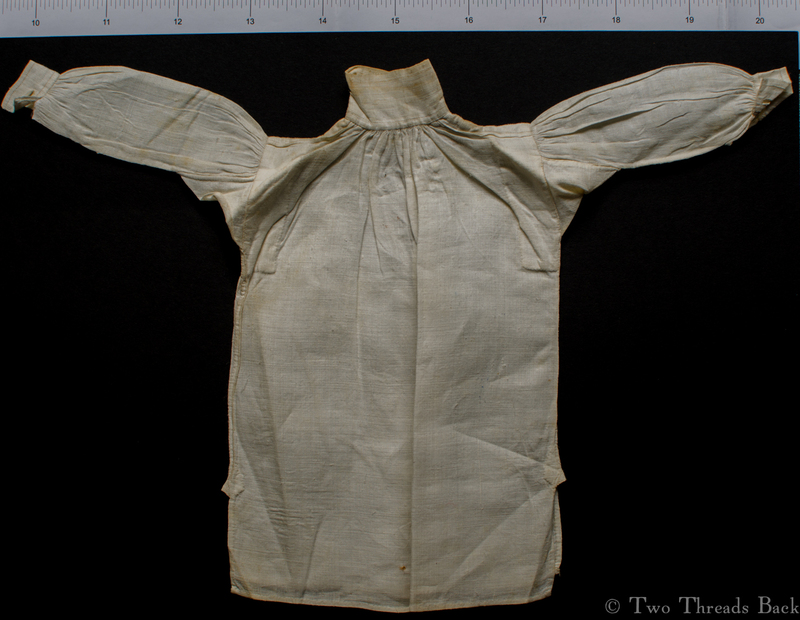 The back – notice the “binders” which line the armscyes inside the shirt. 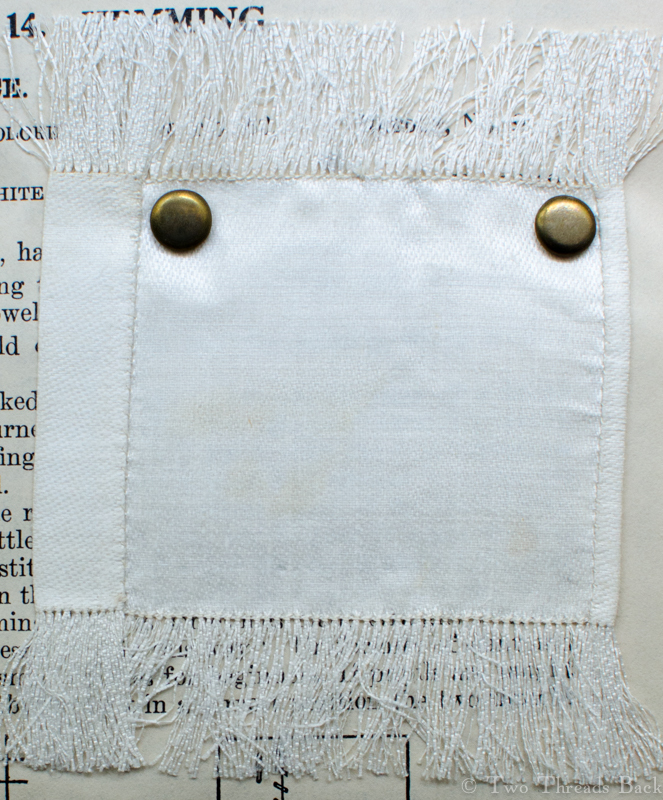 Here you can see the tiny collar gusset, over which the “shoulder strap” lies. 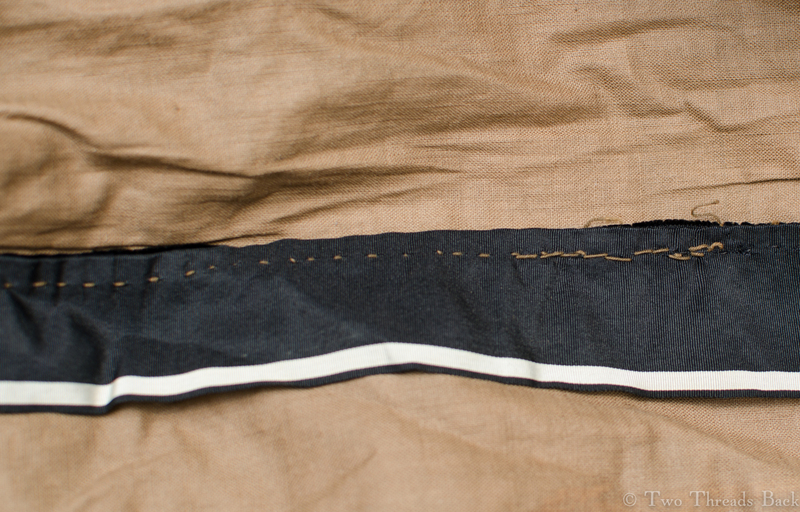 A view of the shoulder strap which is backstitched on both edges. 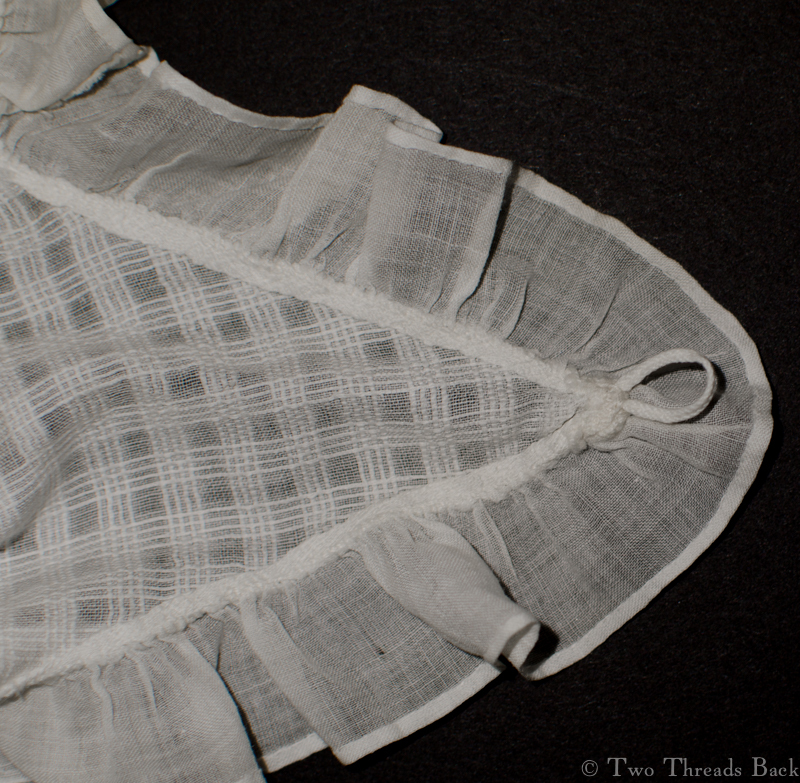 The sleeves are set into the body with gathering and stroking. 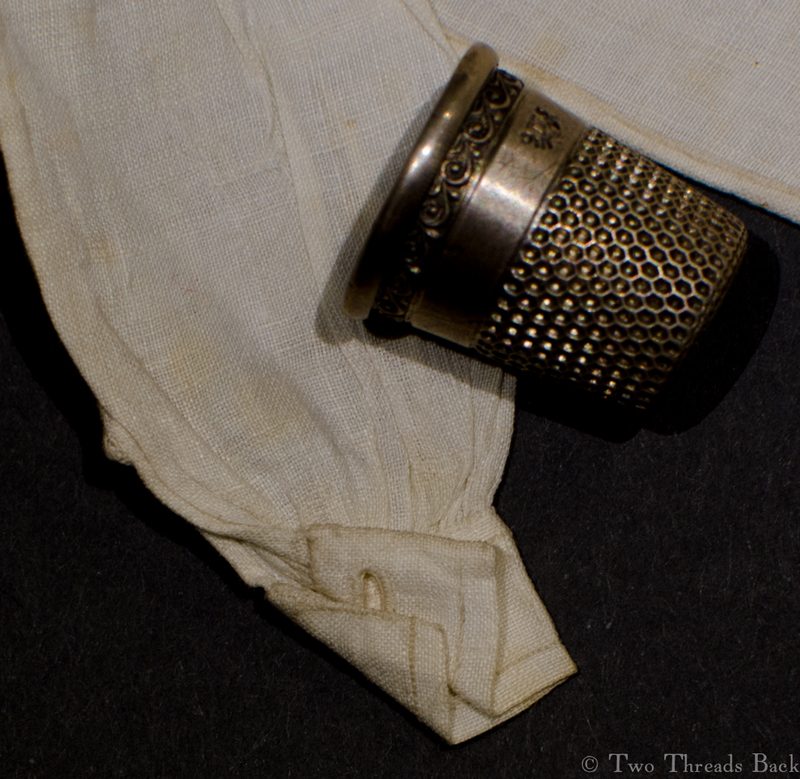 You can barely see the diminutive gusset at the end of the sleeve opening. 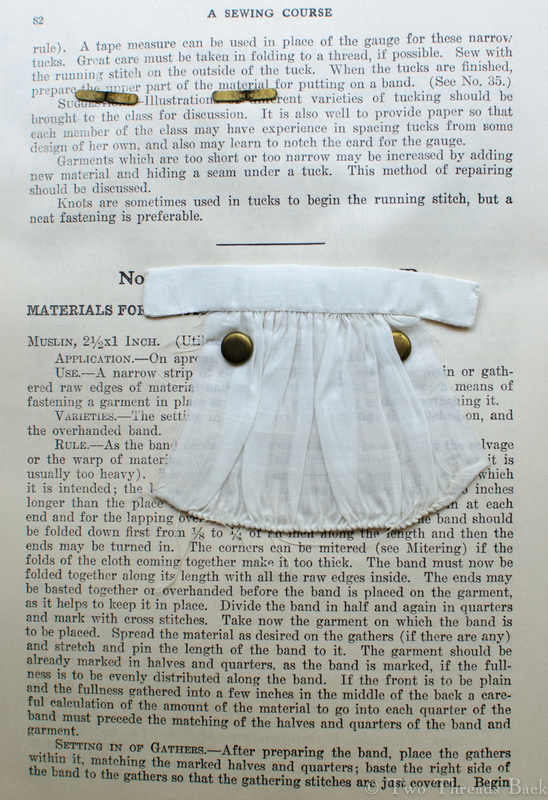 Its purpose was to allow ease, so the shirt would be less likely to tear at that joined seam. 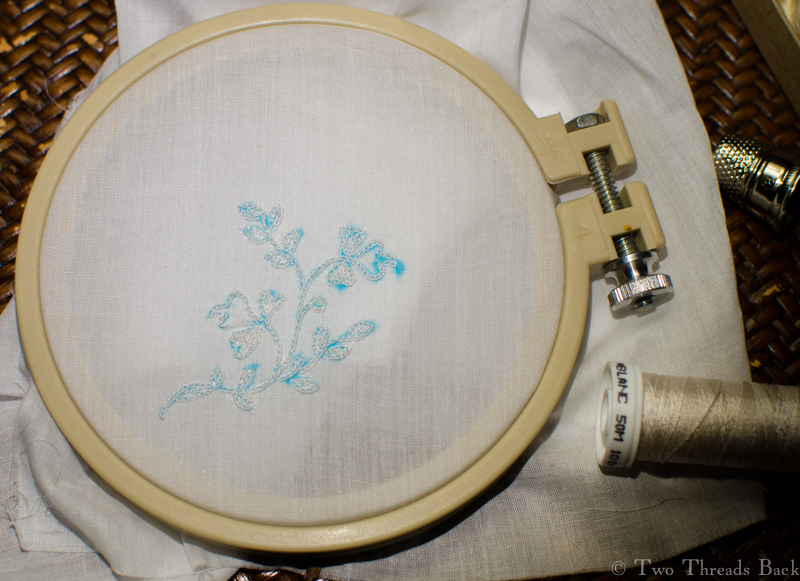 This cuff has come unstitched, and you can see how tiny the sewn gathers are. 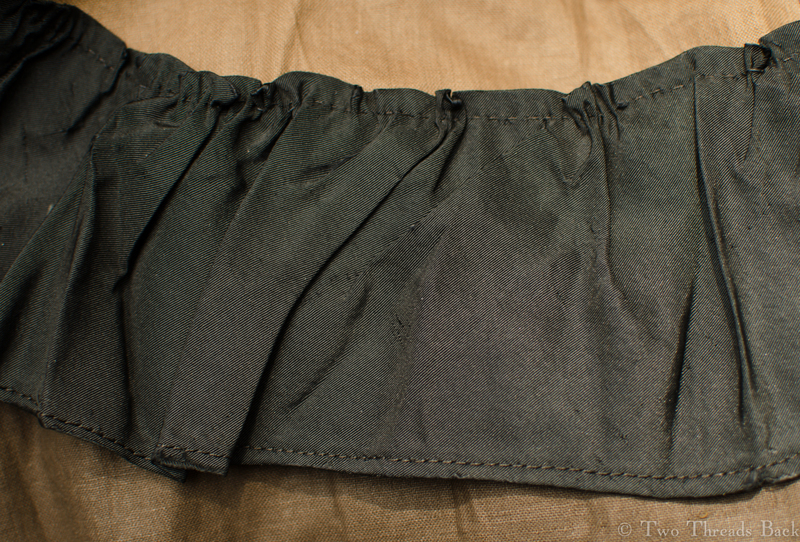 Here is a view of the gusset for the side flaps of the shirt, also meant to reduce tearing and the seam. 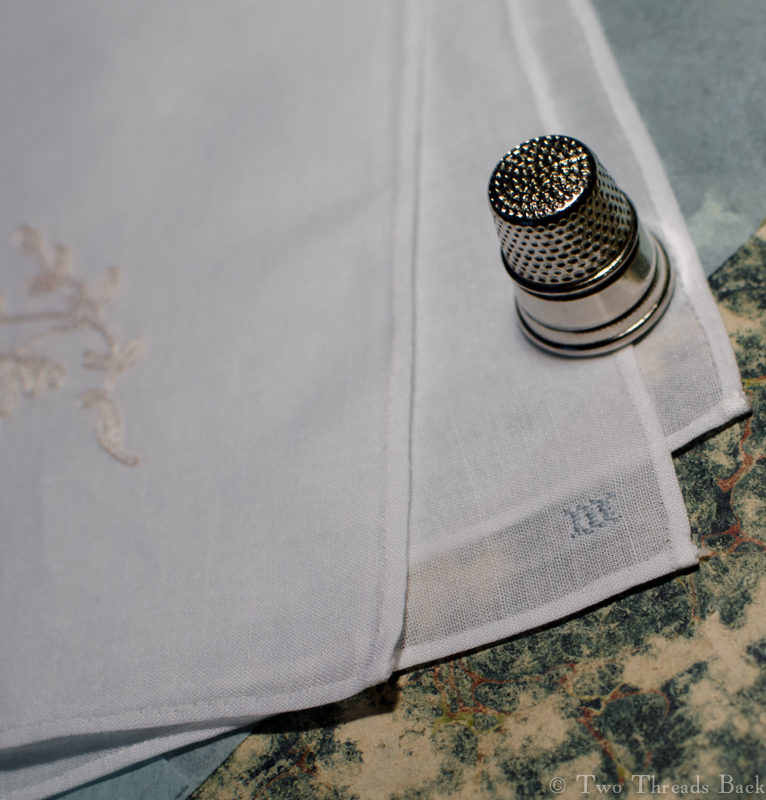 Colin Firth in a wet linen shirt, or a sampler made by tiny fingers in days long gone? I don’t know which one makes my heart beat faster: the man-sized or the miniature. But who would shrink from a closer examination of either? 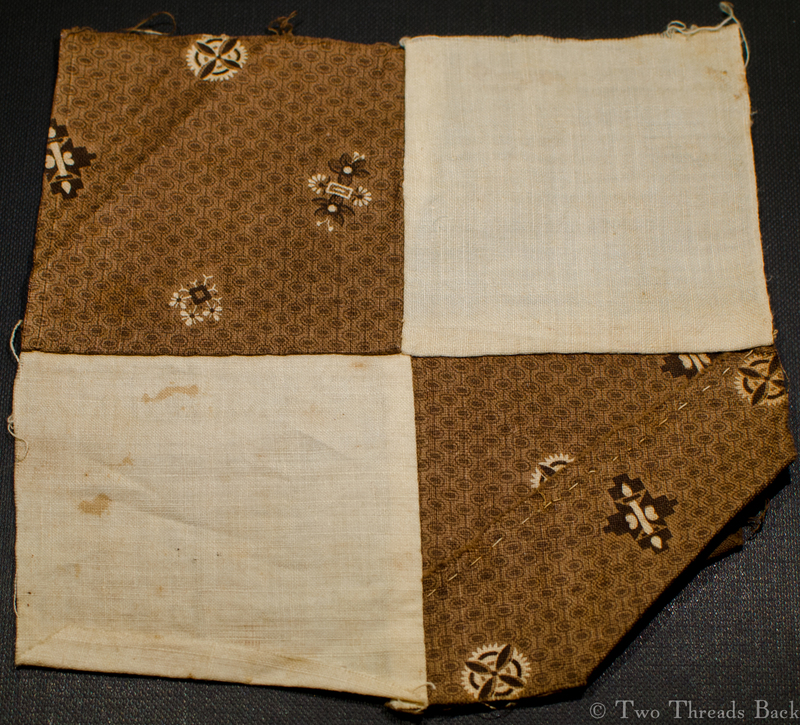 Mary’s neat sewing, with the squares joined by “seaming.” The finished block measures 5 1/2 inches square. 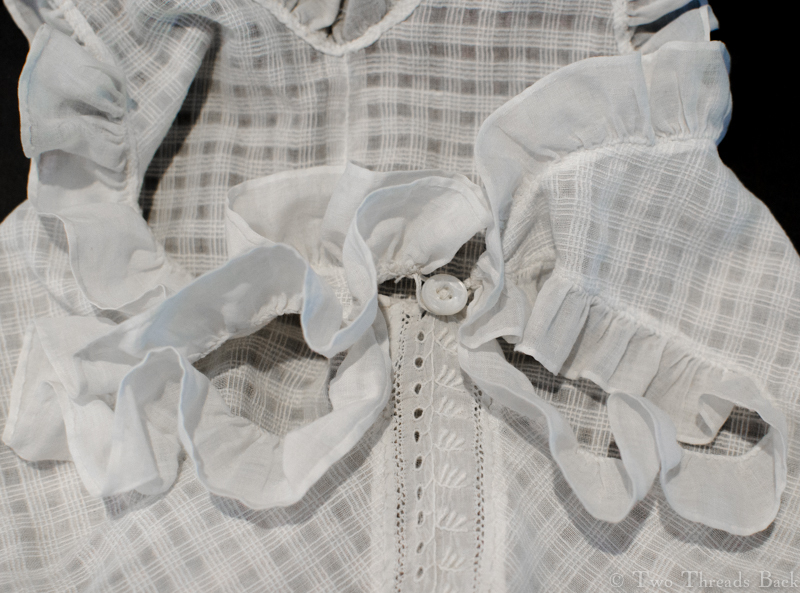 There once was a lady who lived and sewed in New England, way back around 1810. She had a little girl who wanted to help, and so she taught her how. This lady (I’ll call her Mary because there’s a 27.4% chance that was her real name) was making a simple quilt out of four patch squares. Calico was dear, so she used every teensy scrap she had to make the patches. 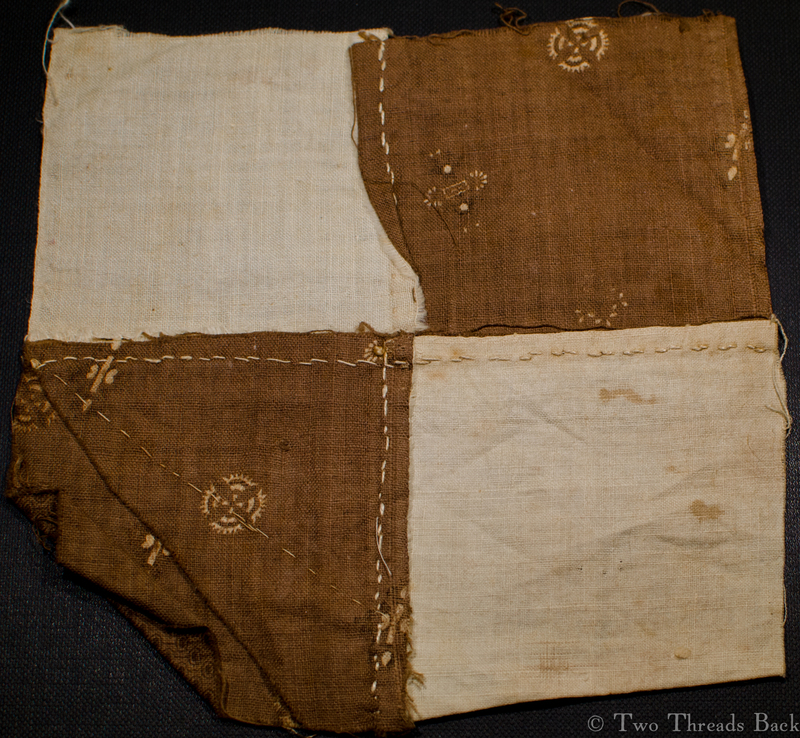 This is a view of the back showing Mary’s careful piecing. 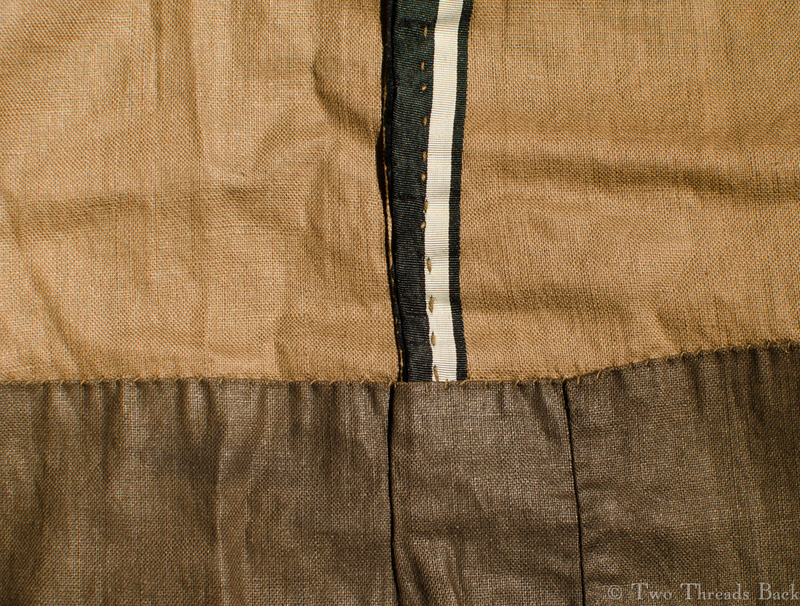 The narrowest blue striped bit measures 3/8″ inch, not including the seam allowance. She gave Betsy (I’ll call Mary’s daughter Elizabeth because there’s a 14.3% chance that was her real name) some squares to practice on. Betsy wanted the pretty patterns to work with, but Mary was reluctant to use those for lessons, so she compromised. One print, one plain. Betsy’s finished square. Do you notice something a little odd here? Well, Betsy finished her block, and Mary finished 89 others. Then she packed them all away. They were never made up, but remained in a box in the attic for 200 years. Don’t you wonder why? Betsy’s work from the back. Yes, her stitches are a little clumsier than Mary’s, but she was learning. And they’re straighter than mine – go Betsy! 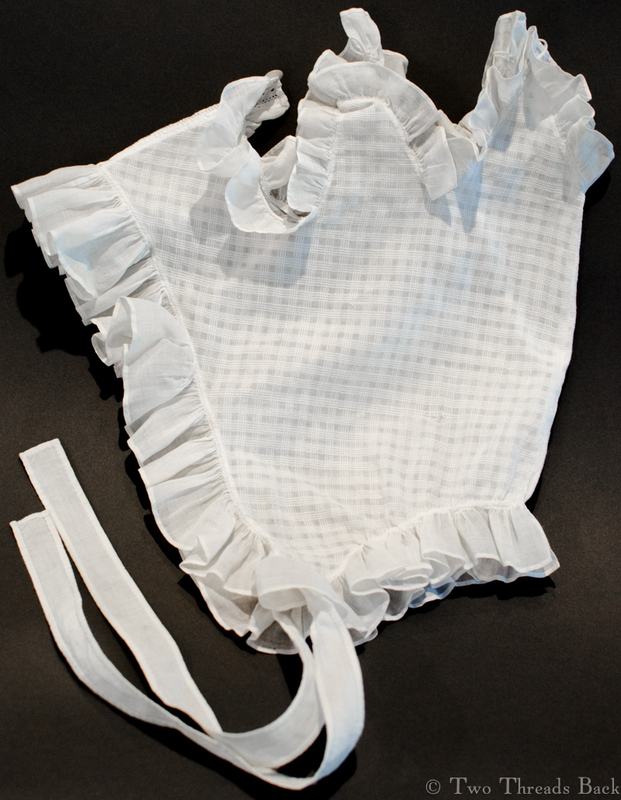 A cotton chemise, unlike either the French or English styles below. I’m going out on a limb here and guessing… American, 1853. Wouldn’t you know it? Maybe there’s a Murphy’s Law of blogging. Just after proclaiming in my last post that there were no noteworthy distinctions in French and English chemises, I came across the illustrations you see below. 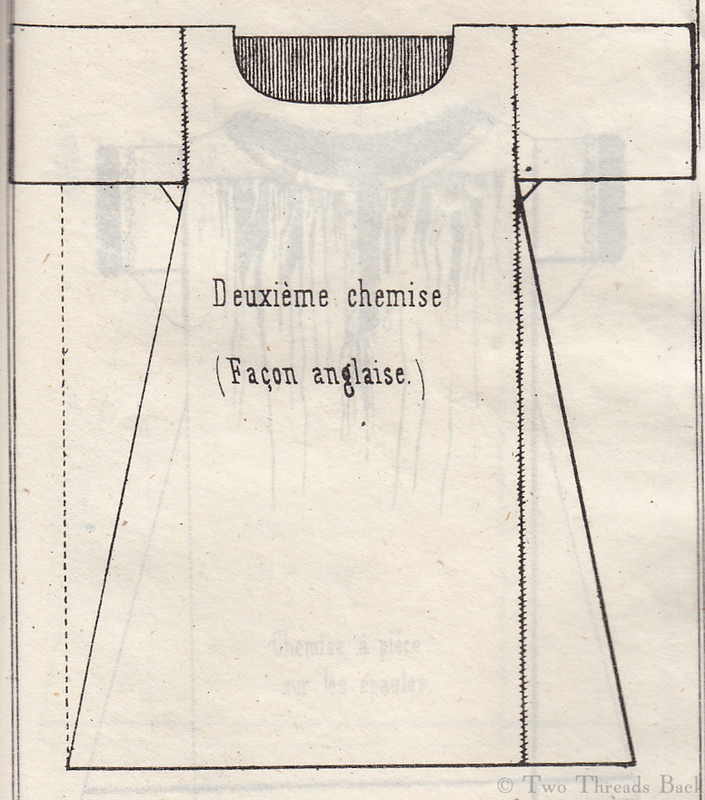 The only difference mentioned in the accompanying text is that the English style is for “skinny persons.” There may be more clues in the cutting directions, but with no knowledge of French, I’ll have to let that pass. 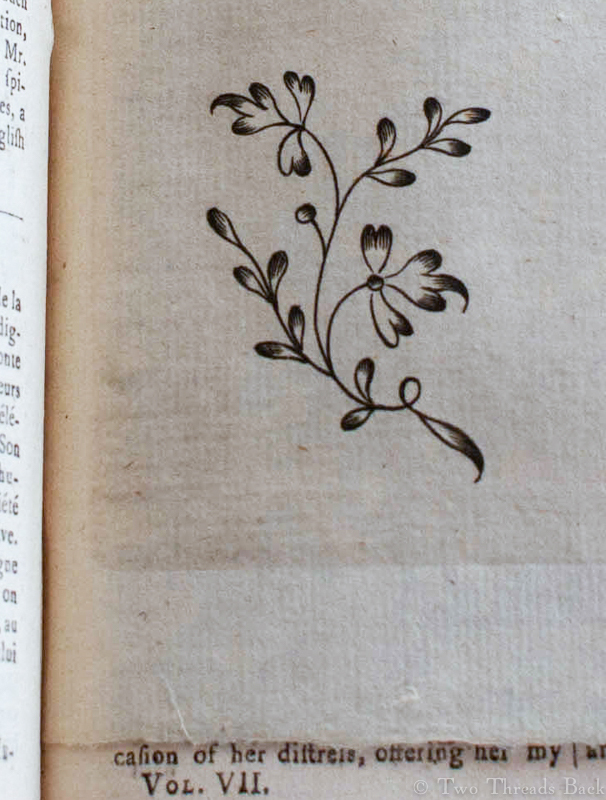 The book was published in 1847, and is surprisingly primitive, at least compared to the detailed and beautifully illustrated French magazines of the same period. 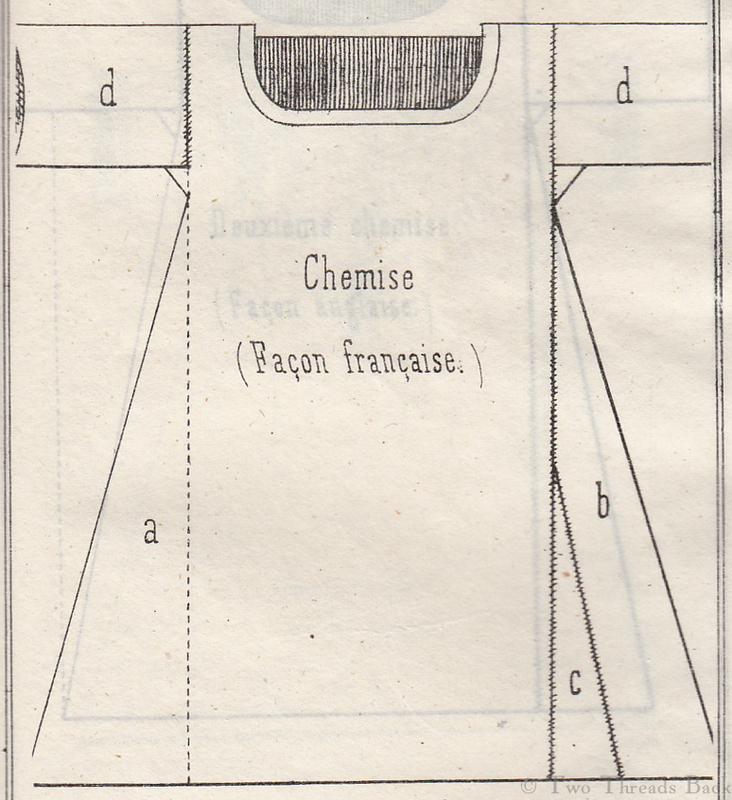 Chemise Francaise. Of course it looks more complicated – they have a reputation to uphold. Chemise Anglaise. No nonsense, for skinny persons.